Introduction by Gilad Atzmon: We are all aware of the Hasbara trolls, the Wikipedia Jews and the Israeli Neocon smear outlets. In the following important piece, internet expert Jonathon Blakeley explores the vile and destructive impact of Sayanim and Hasbara agents on the social networks. What we really see is a surge of Zio-centric anti- social behaviour in our midst. They are united against humanity, humanism, pluralism, freedom of expression and tolerance basically all those things that are precious to the rest of us. Ed: They are a powerfully disruptive and hate-fueled force in YouTube. I am not one to censor my comments but in YouTube it is a necessary fact of life. My site is regularly riddled with idiotic messages that would shame any decent soul. What really angers them is when you just erase and ignore... refuse to buy in to their BS. Hasbara is a Hebrew word defined as explanation. 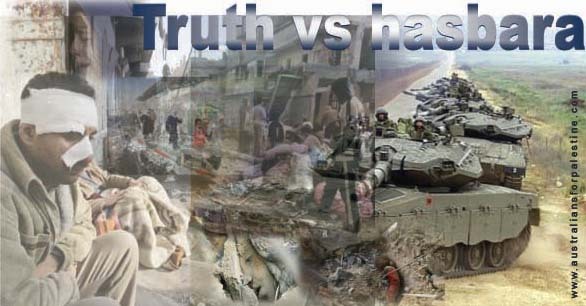 The purpose of Hasbara is to explain and educate western people about the Israeli mission. Hasbara can take many forms, adverts, websites, comments on blogs, letter writing, protests and so on. For a fuller idea of the depth of Habsara check this tool-kit from the We Believe in Israel Website. (Made by BICOM). The difference between propaganda and hasbara? I would say Hasbara is more of a soft sell at first; it seeks to inform, influence and educate the ignorant to the Israeli cause. The narrative of Hasbara has a victimized quality underpinning it, a very passive-aggressive approach; Israel is always defending not attacking. They play the mis-understood victim and invite their critics to attack them. The sub-current being that Israel’s message is not understood. Israel views that the reason for this is either lack of education or stupidity. So the Hasbara agents explain until they realize that they are getting nowhere and then respond with disdain and disgust. ED: It has been my experience that, no matter how courteous but firm my response, they return with the foulest of sexual slurs against me and mine. By foul, I mean concepts that I would never even have considered possible in terms of the depths people can go to denigrate. They will use many tactics. There is even one who poses as a hate-filled dyslexic teenager that I run across often enough at one site. Key individuals are identified, some support Israel others oppose. These are the influencers, on Twitter they are people with over 1 000 followers and over 1 000 tweets. By seeking to influence and control these key individuals, Hasbara agents can influence many many more. Hasbara trolls on twitter try to act as shepherds for the tweets, making them go this way or that. A troll traditionally on the Internet is someone indulges in off-topic abuse. 3. Or of otherwise disrupting normal on-topic discussion. I believe that calling someone – anti-semite or neo-Nazi or racist is inflammatory, unless that is their actual beliefs. By controlling information one can control people and the social networks. Hasbara volunteers help to police social networks for Israel. The big media are dealt with through BICOM and AIPAC, whilst the social media are policed unofficially by the Hasbara troll brigade. Priority is to stop influencers being compromised by anti-Israel sentiment. Hasbara Trolls are generally quite polite at first. They pop up when someone is critical of Israel and its policies or interests. They target, write, engage, educate and insult. From my research it seems that there is some kind of hierarchy of trolls, they have leaders who tell them targets and guide them with their spin. Most work voluntarily but some are paid for by wealthy sponsors. They track topical keywords and persons using public websites such as topsy.com. Problems arise if one rejects the explanations being offered by the trolls, then their troll nature becomes apparent very quickly as they resort to smears and abuse. Hasbara trolls use internet alerts to warn them when hot keywords are mentioned. Keywords such as Israel, Jewish, Judaism etc. When those words are mentioned they are alerted and they go to investigate who is talking about what. 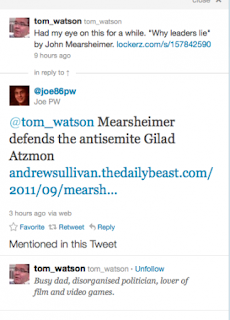 Do you know Gilad Atzmon is a notorious… anti-semite? Neo-Nazi, holocaust denier. Etc. etc. The way to spot the troll is the inflammatory language. If Gilad was an anti-semite it should be self evident but he says quite clearly in his book “the Wandering Who”. “In this book I will try to untangle the knot. I will present a harsh criticism of Jewish politics and identity. Yet it is crucial to mention at this early stage that there will be not a single reference to Jews as ethnicity or race. In my writing, I differentiate between Jews (the people), Judaism (the religion) and Jewish-ness (the ideology). This book does not deal with Jews as a people or ethnicity. If anything, my studies of this issue suggest that Jews do not form any kind of racial continuum. In short, those who are searching for blood or race-related interpretation on Zionism will have to look for it in someone else’s work.” Gilad Atzmon P15 Chapter 1 ~The Wandering Who. Jews (the people) ~ born a Jew, being Jewish. Judaism (the religion) ~ Jewish beliefs. Despite Gilad Atzmon making a clear and unequivocal point above, it has not stopped many zombie zionist Hasbara trolls from accusing him time and time again and many others of anti-semitism or being a neo-Nazi. What is wrong with these pathetic and misguided people? Can’t they read, or have their brains just curdled in their own cranium. The truth is they choose not to read or listen or debate. These people are the new Book burners, those that oppose freedom in all its forms. These Hasbara trolls oppose free speech and try to suppress open and free debate and instead replace it with their own Hasbara wash & spin. It is astonishing the amount of times I have seen trolls warning people not to read this book or that book. Why do we have all these twitter trolls trying to influence what people choose to read? We must unite to name and shame these despicable individuals as they try to suppress free and open debate. These people pose a great threat to our political systems and must be identified to stop them spreading their vile mis-information far and wide. 1. Turn up randomly asking question about Israel, trying to engage/educate. 2. Guilt by association, they point to some source you are linked to as being anti-semitic or neo-Nazi. 3. Opportunity to redeem ~ the offer chance to recant from your naive ways. 4. Smears and insults ~ if the top 3 fail then it’s just character assassination. 5. Name bombing ~ using seo in black hat ways to denounce and smear people. I.e. website with 37 mentions of someone’s name will probably get a Page one on Google. 6. Hasbara trolls generally follow the rules of social networks, because they want to continue to influence people and subvert open and free debate. After repeated attempts to indoctrinate you, I mean educate you, the Hasbara trolls then resort to name bombing. Mentioning a person’s name as many times as possible on social network sites to create negative report with strong SEO. Basically using the internet to smear people to the maximum. Hasbara Trolls are well organized and have links they point to prove their flaky points. Although the links these trolls cite are often from their own Hasbara chums and the blogs they reference do not have original source material just second hand re-cobbled quotes. But there are many who would like us to think so. To dis-credit him and his ideas. But it is not just Gilad Atzmon who is the target of the Hasbara trolls the list is long and growing. To the right are a series of tweets from #Joe86pw, I have observed him part-time trolling on many occasions. Here he spots that Tom Watson famous Labour MP is thinking of buying a new book by Mearsheimer. ~ “Why leaders Lie”. Joe spots this tweet and shortly after is tweeting a helpful warning to Tom Watson MP (Hackgate MP) about that dangerous book. In these following tweets we see the “Emma Rosenthal” guiding a troll. @johne326 got upset when I placed him on my troll list. I asked him why he was trolling Gilad Atzmon and he responded to me that it was clear to him that Gilad Atzmon is an anti-semite. All I want to say is this John,” look up the definition of trolling”. I have never been into politics but sure enough the lovely open-minded “Emma Rosenthal” wastes no time at all in denouncing me as a “White supremacist”. emma_rosenthal 2:09pm via Web . 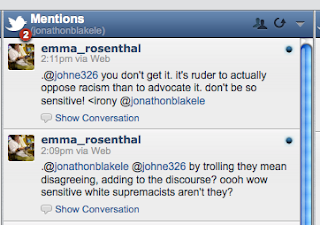 @jonathonblakele @johne326 by trolling they mean disagreeing, adding to the discourse? oooh wow sensitive white supremacists aren’t they? emma_rosenthal 2:11pm via Web . @johne326 you don’t get it. it’s ruder to actually oppose racism than to advocate it. don’t be so sensitive! 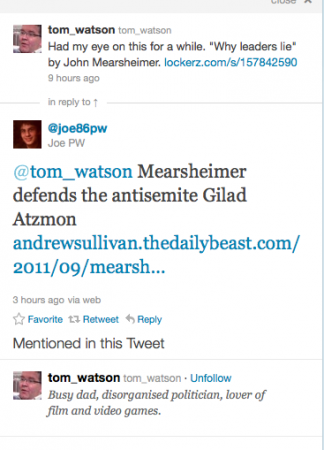 Just mentioning Gilad Atzmon on twitter is sufficient to attract the Hasbara vermin within a very short time. They all know each other as well and they enjoy bullying dissenters with their chums. Really it is just like being back at school being bullied by the school gang. Usually the lead bully goes into to attack whilst others stand by making encouraging noises. We are ‘told’ that we live in a free society, but we don’t! Free speech and debate are being squashed by the likes of BICOM, AIPAC and a small army of annoying Hasbara trolls. We must work together to stop them. From Truth comes Peace.